Power Supply: 7.5-15.0 Vdc approx. 50 ma. nominal power, 24 VDC maximum 100 ma current draw (we suggest our PS9J a 9VDC 400 ma unregulated power supply). GND and Shield: THE GND and Shield terminals are connected on the ADIO-100 board and are therefore electrically equivalent. RS-232 Cabling: The RS-232 interface uses a "3 wire" RS-232 connection. 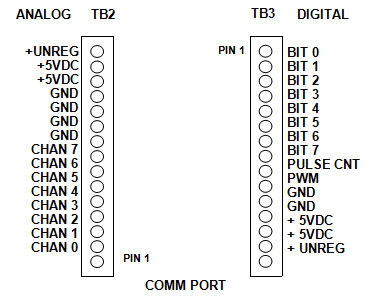 That is to say only three wires are connected between the I/O Module and the Host PC: TxD, RxD, and GND. RS-232 Flow Control: The HomeSeer Technologies modules to not support hardware or Xon/Xoff flow control.